Myo sho Baika Andrea Heaton née Pratt (b.1960) is the founder and Abbess of Mt. Diablo Zen Group in Pleasant Hill, California. Baika is a Dharma heir in the lineage of the great Shogaku Shunryu Suzuki-roshi—founder of the San Francisco Zen Center. She has practiced Zen meditation since 1987 and received Dharma transmission in 2011 from Myoan Grace Schireson, Abbess of Central Valley Zen, California. Baika also has undergone Soto Zen training with Sojun Mel Weitsman-roshi of Berkeley Zen Center where she was a resident for many years. She is a graduate of the SPOT Leadership Program of the Shogaku Institute and has been certified by Mindfulness Schools to teach Mindfulness to children in public schools. Baika is a recipient of the Peace and Justice Award in Contra Costa County. Shinko Seiwa Leslie Bartholic is the Co-Guiding Teacher of the Mt. Diablo Zen Group. She began Zen practice in the early 90s with a Thich Nhat Hanh sitting group and with monthly sittings at Green Gulch Zen Center. 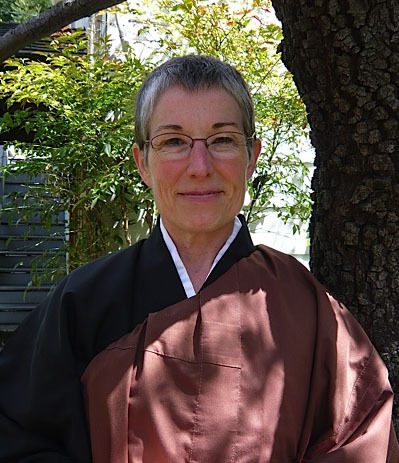 In 1999, Leslie began practicing at Berkeley Zen Center, where she has held many of traditional Zen temple positions, including serving on the Board of Directors and Practice Committee. She received lay ordination from Sojun Mel Weitsman Roshi in 2002, served as Shuso in 2011, and received lay Entrustment July 10, 2017. Myoho Joshin John Busch is a Zen Priest leading the monthly half day sittings and co-leading the Wednesday evening program with Leslie Bartholic. He began his Buddhist practice in college. As a Peace Corps volunteer in Thailand he was stationed near Ajahn Chah and practiced at his forest monasteries. He continued practice in the U.S. at various temples for a decade in the Theravada tradition. His first Zen Teacher was the renowned Tassajara chef Ed Brown, who he studied with for a dozen years. The next decade he practiced under Mel Weitsman and Alan Senauke at the Berkeley Zen Center, serving in various temple positions. He did a three-month residential practice period (Ango) at Tassajara Zen Mountain Monastery in 2011. He was ordained as a Zen Priest in 2015 by Baika Pratt-Heaton and was head student (Shuso) at MDZG in 2016. John is trained as a chaplain, hospice caregiver, grief recovery specialist, and home funeral guide.